This time last year, I started looking into getting solar panels. Why? I wanted to save some money on our ever-increasing electricity bill and thought going green would be cool, too. I contacted a few of the major players: Verengo, Sungevity, and Solar City. Boy, did I get more information on kilowatts than I ever thought I needed. After going through basically the same qualification process with each company, we got the biggest bang for our buck with Sungevity. As part of our decision process, I asked everyone I knew with solar panels why they either own or lease. Everyone that owned their panels said the only reason why they owned them was because back when they bought them, leasing wasn't an option. But if they had an option, they would have decided to lease. As a result, we decided that leasing our panels was the best fit for our family since 1) it didn't require any money down and 2) we were then locked into the same monthly rate for the life of our lease. Considering that electricity rates increase each year, the locked-in solar rates definitely seemed like a good deal. To top it off, I discovered that our electricity rates actually went down once we had our solar panels installed. I guess solar panel customers get special, lower rates! 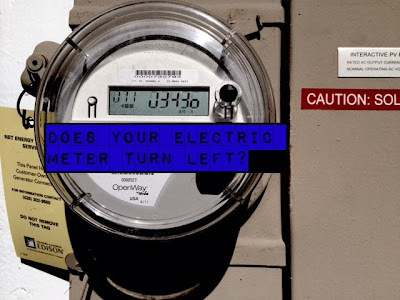 My favorite part of all this: watching my electric meter run backwards when we are producing more energy than consuming. All in all, we are very happy that we decided to take the plunge and get solar panels. Have you ever thought of getting solar panels, too? Quotes from Sungevity (and its competitors) are FREE!! You have nothing to lose (well, except dollars off your electric bill). Now through March 31, anyone that uses the referral code 329439 will get $1000 off the price of their system. (Typically, it is just $500.) If you have any questions about our experience with solar panels, please feel free to leave a comment below or email us at info@housescouchesandbabies.com.